Setup instructions may vary by the identity provider(IdP). 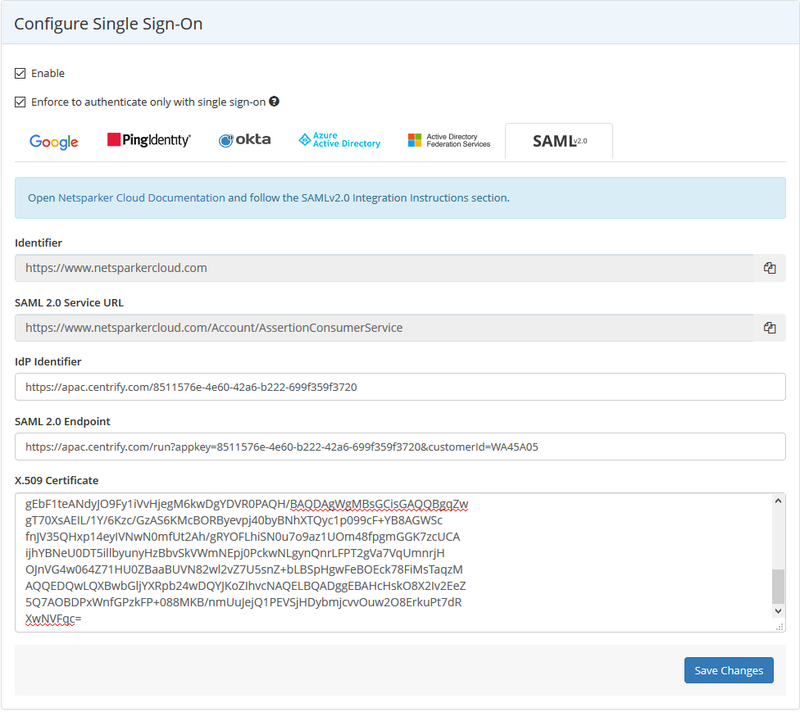 Contact us if you encounter any problem while setting up Single Sign-On (SSO) integration. Log in to Netsparker Enterprise, and from the main menu, click Settings, then Single Sign-On. The Single Sign-On window is displayed. Select the SAMLv2.0 tab. If your IdP (Identity Provider) requires you to specify a SAML Identifier for Netsparker Enterprise (it may also be referred as the Audience or Target URL), use the value of the Identifier field. If your IdP requires you to specify Consumer URL (it may also be referred to as the SSO Endpoint or Recipient URL), use the value of the SAML 2.0 Service URL field. Retrieve the URL from your IdP's IdP Identifier field and paste it into Netsparker's IdP Identifier field. Retrieve the URL from your IdP's SSO Endpoint field and paste it into Netsparker's SAML 2.0 Endpoint field. Export your X.509 certificate, copy its content and paste the certificate value into Netsparker's X.509 Certificate field.